As followers of Christ, we are called to serve others. Just as Jesus humbly served the people around Him we are expected to work and help others in need. We should do good deeds, but with the right attitude and intentions. Our work should never be about getting glory for ourselves, but instead, it should point to God and give Him glory. 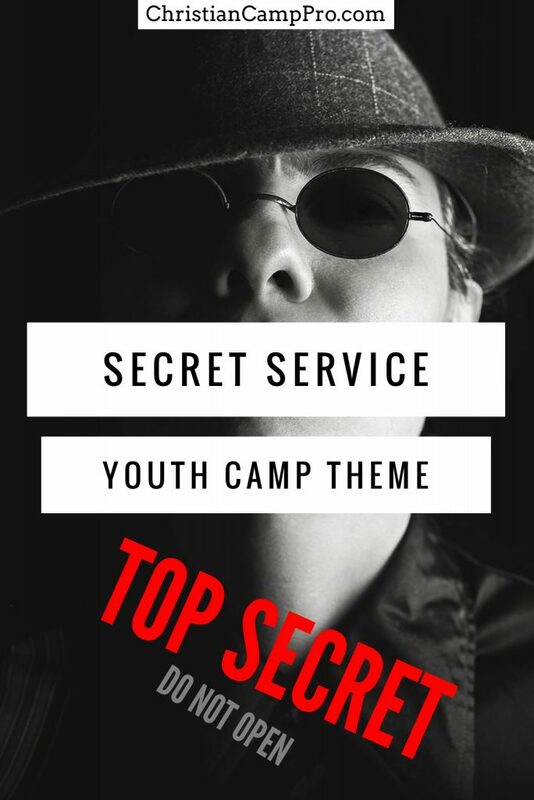 This Secret Service youth retreat theme will teach young people about the importance of serving God and others and also how to do good works in humility and without fanfare. It’s great to tell people that we love them. It’s even better to show them. Putting our words into actions shows others that we care enough to follow through with what we say. It’s easy to say we care about a person or cause. It’s much more difficult and requires more commitment to actively work to show our care. Use this verse to encourage young people to be not just sayers, but doers. 10 Therefore, as we have the opportunity, let us do good to all people, especially to those who belong to the family of believers. God expects us to serve everyone, not just the people who look like us. That means we should show kindness and offer help to all people regardless of race, gender, social status, etc. Sometimes that may mean stepping outside our comfort zone and going places we wouldn’t normally go, for example, a nursing home, a homeless shelter, a prison. Going to such places requires courage and commitment, but it demonstrates to others that you care. Use this scripture to remind young people about the importance of serving all people. Everyone loves a good pat on the back. However, that should not be our motivation for doing good deeds. When we serve others, we should do so with love and with no expectation of thanks or recognition. We shouldn’t brag on social media about our volunteer efforts or expect accolades when we give to the less fortunate. Use this scripture passage to teach young people that service is about love and humility and not about personal recognition. This meaningful craft is simple but super useful. Give each guest his or her choice of fleece fabric. Allow them to follow the easy instructions for cutting the fabric and tying the knots. Each guest can make several blankets. When finished, gather the fleece blankets and donate them to a local hospital or shelter. For this project, you will need an assortment of items such as mini hand sanitizer bottles, toothbrushes, packs of crackers or granola bars, bottles of water, and gallon sized freezer bags. Guests can bring in these items or they can be assembled ahead of time. Give each guest a freezer bag and allow him or her to fill it with useful items that might benefit a homeless person. Give the finished bags to a shelter or, as a group, take them to an area where there are homeless people and hand them out personally. This craft is sweet and simple and will make someone’s day. Give each guest a colorful pair of soft fuzzy socks, a pom-pom (you can also use suckers!) and cardstock or a cute cup cozy for the cupcake liner. Roll the socks up to look like swirled icing and place them in the cup cozy. Place the pom-pom or sucker on top as the cherry and then wrap the cupcake in cellophane or tulle and tie it up with a colorful ribbon. Donate the cupcakes to a local nursing home or women’s shelter. For this game, guests can play as individuals or as teams. Simply collect an assortment of simple service projects and make a chart listing them. Guests have an allotted time to complete the tasks. They can snap pics of themselves doing the tasks as proof of completion. Award no prizes for this game but remind players that blessing others is its own reward. Use one of these fun and challenging codes to create a secret message for guests to unlock. The message could be a request for help with another service project or one of the scripture passages. The first guest to crack the code wins. For this activity set up a room or area of your retreat space as a challenging lock-up. Set up tasks that guests must perform in order to find clues and ultimately escape from the room. Tasks should be service oriented and limited to the area of play. Each team will have a set time in which to escape. The team with the best time wins. This project can serve as another craft and encourages creativity for guests. Give each guest a smooth rock and craft paint. Allow them to paint pictures, write happy messages or scripture verses or encouraging words on the rocks. When the rocks are dry, guests can take them home to drop around their communities for other people to find. The idea is for the finder to then drop the rock somewhere else for another person to find, thereby spreading the message of kindness and encouragement. Help the attitude of service continue outside the retreat by giving each guest a special mission folder to complete at home. Personalize the folders for each guest. Guests can “check-in” via email or social media as they complete missions to encourage follow-up. Service is a necessary part of being a follower of Christ. He showed by example how to work and help others. A Secret Service retreat can help young people learn ways to serve others and also teach them how to serve in humility and with grace. Special thanks to Midwest Bible Camp and Conference Center for making this article possible.